21 all-new ornament patterns. Why do we celebrate Christmas? Beaded ornaments tell the story in Elaine Clanton Harpine's newest collection of Christments. The designs focus on the symbolic meaning of each aspect of the Christmas story. 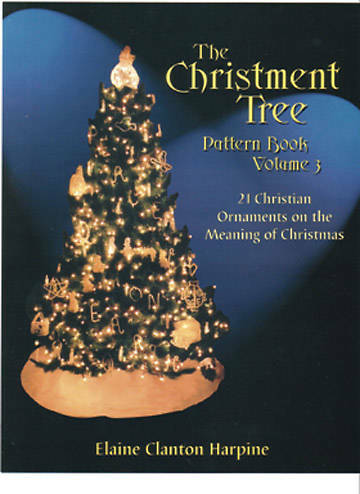 Over half of the Christments in this volume are easy enough for first- through third-graders to make. The reason for Christmas is reinforced on a kinesthetic level, through the manipulation of chenille stems and stringing beads. The patterns are arranged from the simplest to the most challenging, with supply lists and easy-to-understand instructions included. Some of the ornaments include the dove of peace, magi from the East, Mary's donkey, a miniature church and a beautiful Saint Lucia tree topper. Includes a story for the hanging of the Christments in a church service. Don't forget to pick up Volume 1 and Volume 2, if you don't already have them.